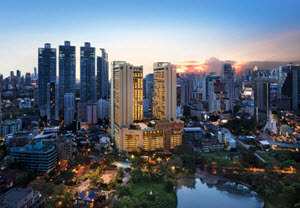 The official hotel for the 2018 Labels and Packaging Innovation Asia Conference in Bangkok will be the Marriott Marquis Hotel, Queen’s Park, a 5-star hotel in the EM District of Bangkok surrounded by the city’s most celebrated shopping, dining and nightlife attractions. Its rooms feature modern Thai-inspired design elements with panoramic views of the Bangkok city center and 5-star hotel amenities. Note: The room rate includes buffet breakfast and 17% tax.